It was another successful run of the Brigada Eskwela 2018 by the Department of Education (DepEd) here in Naga City and Camarines Sur. The Brigada Eskwela, the annual National Schools Maintenance Week conducted last May 28 to June 2, 2018, aims to gather all education stakeholders to participate and contribute to making public schools ecologically conscious, clean, and conducive to learning prior to the start of classes. This year’s Brigada Eskwela theme “Pagkakaisa Para sa Handa, Ligtas at Matatag na Paaralan Tungo sa Magandang Kinabukasan,” embodied the Bayanihan style cooperation that everyone involved in the activity showed. As one of the partners in community development, the Metropolitan Naga Water District (MNWD) through its Corporate Social Responsibility program made Brigada Eskwela one of its major projects this quarter with the incessant support from the Board of Directors led by Chairman Jorge T. Palma and the Management team headed by Acting General Manager Virgilio B. Luansing I. With 21 beneficiary schools this year both from Naga City and 4 municipalities in Camarines Sur, the MNWD distributed customized water drums including information, education, and communication (IEC) materials. The water district also provided plumbing services such as basic water pipeline repairs with the initial inspection of the schools conducted on the first week of May. Last Thursday, May 24, MNWD together with its official mascot “Isay” participated during the kick-off program hosted by the Naga City Science High School (NCSHS). Further, the team provided some entertainment to the students of Calauag Elementary School on the first day of classes on June 4 with the special appearance of “Isay.” This outreach was made possible by the gracious permitting of school principal Dr. Ma. Theresa R. Ruizo. The pupils had an early first-day high from the intermission shared by our very energetic mascot and gained valuable insights from the brief talk on water, sanitation, and hygiene (WASH) and water conservation given by Maide D. Sison, Public Relations and External Affairs Section (PREAS) Head. Meanwhile, on June 1, Ms. Sison together with representatives from DepEd Naga and the Barangay Council, were invited to judge the Best Brigada Eskwela Implementing Grade Level at Calauag Elementary School. The event was meritorious because the said school was able to gain constructive responses from the comments and recommendations by the judges relative to improvement plans. CUSTOMIZED WATER DRUMS. 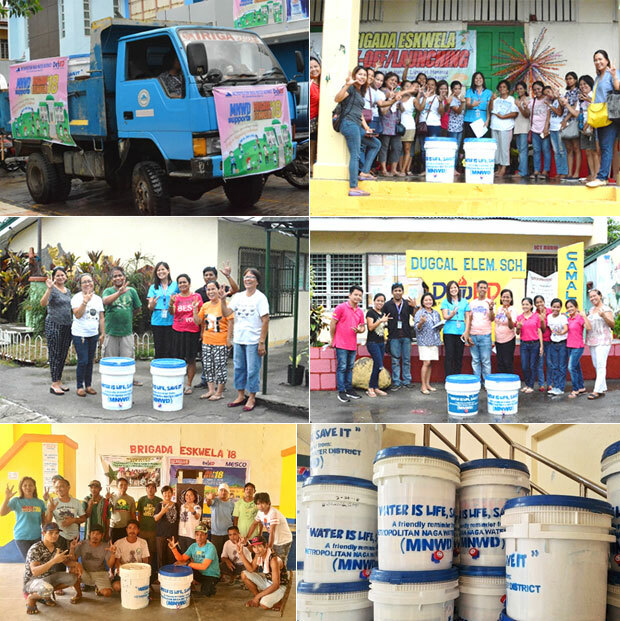 The MNWD distributed the customized water drums to the beneficiary schools within its service area during Brigada Eskwela 2018. WATER SERVICE LINE REPAIRS. Apart from the customized water drums, the MNWD also provided basic repair of the beneficiary school’s water service lines as part of the District’s Brigada Eskwela program. FIRST-DAY HIGH. The MNWD paid a visit at Calauag Elementary School per invitation from the school head Dr. Ma. Theresa R. Ruizo (5th from left) to the delight of the pupils and teachers last June 4, 2018 for the opening of classes. BEST BRIGADA ESKWELA IMPLEMENTING GRADE LEVEL The MNWD PREAS Head, Maide D. Sison together with 3 other representatives from DepEd Naga and LGU of Calauag for the judging of the Calauag Elementary School Best Brigada Eskwela Implementing Grade Level conducted last June 1, 2018.